Jorge Valencia reports on Gov. Pat McCrory's suit against North Carolina Senate Leader Phil Berger and House Speaker Thom Tillis. Governor Pat McCrory has filed a suit against House Speaker Thom Tillis and Senate Leader Phil Berger, saying he's trying to stop them from usurping executive powers. The lawsuit, filed in Wake County Superior Court, alleges violations of the separation of powers, executive power, and appointments provisions of the state Constitution, the Raleigh News & Observer reported. Former governors Jim Hunt, a Democrat, and Jim Martin, a Republican, joined McCrory in the filing. Most visibly, McCrory is taking issue with a commission that will oversee the state's 32 coal ash ponds. The governor says he should have been able to name more members of the commission, which met Friday morning for the first time. Lawmakers have also considered creating an independent commission to oversee the Medicaid system, effectively taking away that oversight from the governor and his Department of Health and Human Services Secretary Aldona Wos. 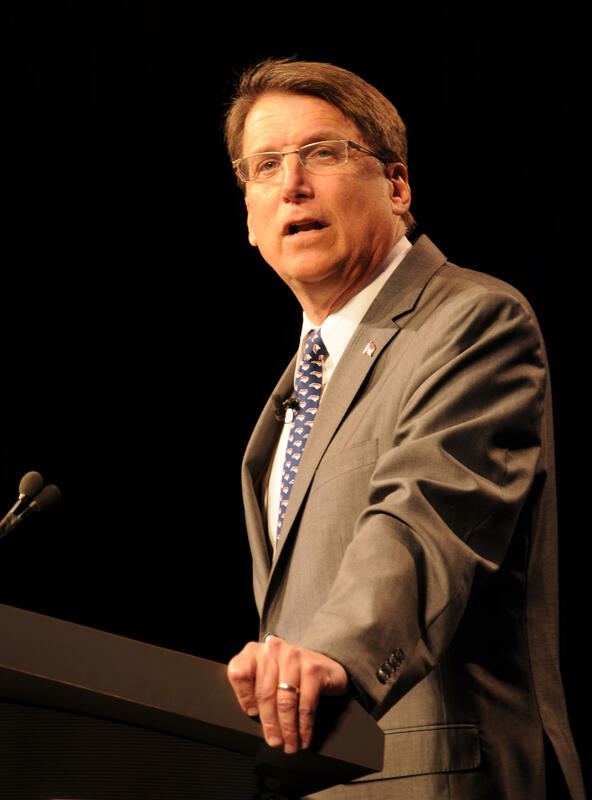 "These commissions make government less accountable to the will of the people," McCrory said in a statement Thursday. "Citizens and voters must be able to distinguish which branch of government is responsible for making the laws and which branch is responsible for carrying out the laws and operating state government." McCrory, Berger and Tillis are Republicans, but they have publicly disagreed over these commissions, the state budget and teacher pay. Berger and Tillis say these commissions are meant to be independent, and that they have the constitutional right to create them. "The General Assembly’s right to appoint members to independent boards – which are beholden to no single appointing authority and provide truly independent oversight – is far from new and has long been upheld by our state Supreme Court," they said in a joint statement Thursday. "The governor’s costly and time-consuming lawsuit to ensure he picks the majority of regulatory board members ignores history and detracts from their important work." The North Carolina Coal Ash Commission has begun the process of creating rules and regulations to manage the cleanup of Duke Energy’s 32 coal ash ponds. The Commission has a huge job. Among other things, Commission Chair Michael Jacobs made it clear that cost will be a consideration. “To the extent that cleanup costs are passed on to the residents and businesses of North Carolina through higher power rates, everyone who uses power will share the expense,” Jacobs said. Duke Energy has said it would cost $10 billion to move coal ash from all sites. A lawyer advising North Carolina's environmental agency on rewriting clean-up rules for Duke Energy's coal ash dumps previously represented the electricity company on the same issue. Craig Bromby was hired in June at the Department of Environment and Natural Resources. He retired in March as a partner at the Raleigh office of Hunton & Williams, where his corporate clients included Duke.